This type of RGB LED Strip connector is particularly useful when you have to connect left over pieces of RGB LED strip to a controller. If you cut your RGB strip in 2 sections, you can still connect the strip to a controller since there’s a connector at both ends of the strip. If you cut your strip in 2 sections, the only thing that you will need is an extra 4 pin connector. 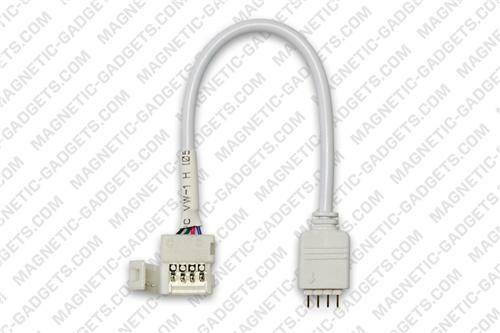 If you cut your strip in more than 2 pieces, in order to connect your strip to a controller, you will need a Quick RGB LED Strip Controller connector like this one. This Solderless Quick RGB LED Strip connector features a quick connector on one end and a removable 4 pin controller connector on the other end.